A big cohort of MUAC athletes took to Lakeside Stadium over three days of competition, collecting medals, PBs and HH Hunter points as the track and field season reached it’s zenith for many MUAC athletes. 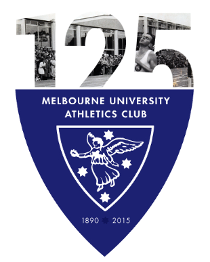 Gold medals and Victorian Championships were won by Kath Iannello, Ellen Schaef, Manjula Wijesekara. 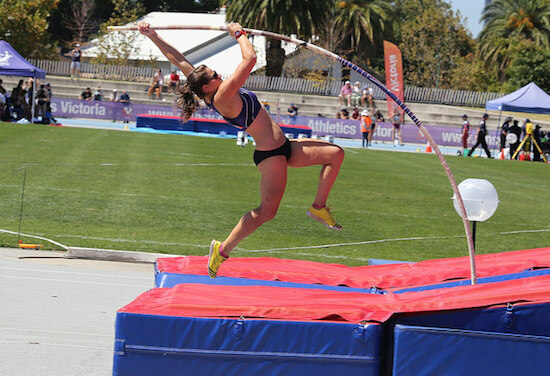 Iannello, fresh from a 3.85m PB at RAC, clinched her maiden Victorian title with a fine vault of 3.70m. Squad mate Tamara Mancuso collected the bronze in the same competition with a 3.60m clearance. Wijesekara lead a trio of MUAC athletes to a podium clean sweep, with 2.21m taking the gold and preparing him well for the upcoming Commonwealth Games. Joel Baden, also bound for the Gold Coast, claimed second with 2.12m off a short run up, and Joseph Baldwin third with 2.09m, and Joel Mason 5th. Schaef, traditionally an 800m runner, stepped up to the metric mile and ran a fine race, working hard in the last lap to bridge the gap to Melissa Duncan and MUAC teammate Katrina Anderson before surging to the lead in the final 50m, with Anderson claiming the bronze to go with her Victorian Mile Championship. Catriona Bisset continued her fine season over 800m taking silver in a big PB, 2:04.28, giving Commonwealth Games bound Georgia Griffith a lot to worry about during the two laps of the final. Sarah McSweeney claimed bronze in the 3000m Steeplechase after an interrupted season. MUAC took third place in the HH Hunter Shield, named in honour of a MUAC alumnus who died in Gallipoli. The weekend also saw the National Junior Multi Event Championships held at Lakeside with MUAC’s Liam Schreck taking 7th in the U20 decathlon, scoring 5794. A big shout out to Pete, Tim, Pippa and Hamish who did MUAC’s duties over the weekend and set up and packed down the MUAC marquee.